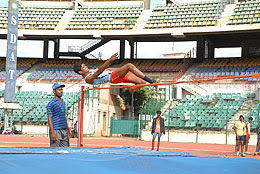 The successful conduct of the previous editions of the inter School athletic meets, organized by KCG College of Technology and Y's Men's Menette's Clubs of Mylapore together city schools, encouraged the organizers to propose and host an inter School Athletic meet at State level. 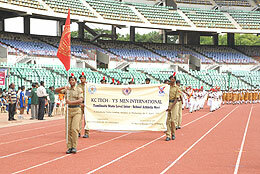 More than 1200 participants from 88 Schools from all over the State participated in this unique event. Some of the leading Schools that fought for the KCG College of Technology Championship trophy are Kajamian HSS, Trichy, D.B.T.R NHSS, Mayiladuthurai, St Joseph Hr Sec School, Chengalpet, Govt HSS, Coimbatore, Mont fort AMHS, Kancheepuram and Velammal HSS, Surapet. They found tough opposition from city schools like SBOA School and Jr College, Pachiappa HSS etc. 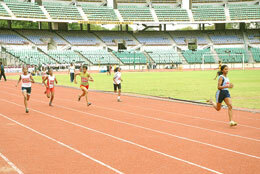 Competitions was held for three categories : Senior, Junior and Sub Junior categories. The champion schools were awarded trophies while . medals and certificates were distributed to the athletes who secured the first three positions.Prize money and trophy were awarded to the group champions. 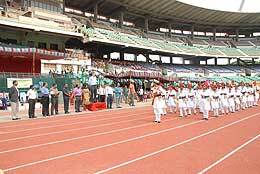 Mr. Jesse Boyd, Director India Operations, Athletic in Action, USA officially inaugurated the meet at 8.30am. 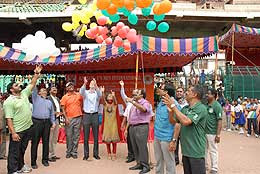 Ms. Surekha Ranjith, International Athlete and PWAF Y'sm Prof. C. Robin, the district Governor, Y's Men International Madras district were the Guests of Honour and Mr. Ashok Verghese, Director, Hindustan University presided over the inaugural function. Mr. C. Rajan IRS., Addl. Director General, DRI was the Chief Guest for the valedictory function scheduled at 5.30 pm. Olympian Jayalakshmi, the first women athlete from Tamilnadu state to take part in Olympics and Mr.C.K Valson, Chairman, Tech Committee, Athletic Federation of India were the Guests of Honor for the valedictory function. HRM Y'sm. Anand Jacob Verghese, Director & CEO, Hindustan group of institutions and Lt. 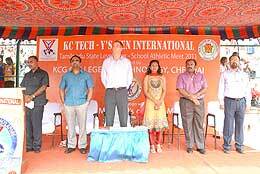 Regional Director, Elect, Zone -I, South India region, Y's Men International presidedover the valedictory function. 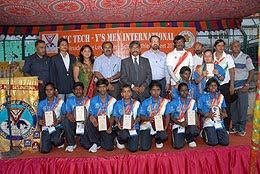 The differently abled athletes from Tamil Nadu who had secured medals at the Special Olympics World Summer Games held at Athens from 25th June to 4th July 2011 were honored during the valedictory function. Chandra Bose - Gold & Silver in Roller Skating. 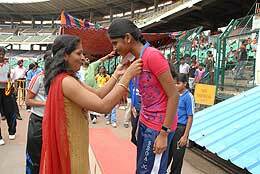 Gokila - Bronze in 4x400 Relay. Hari Srinivasan - Silver in Handball. Coaches: Mr.J. Paul Devasagayam & Ms.Julia Vasanthi. HRM Y'sm. Anand Jacob Verghese, Director & CEO, Hindustan Group of Institutions, PWAF Y'sm Prof. C. Robin, the district Governor, Y's Men International Madras district, Y'sm Joseph Jose, President, Y's Men's Club of Mylapore and Y'sm. Jayasankar Menon, Chief Advisor-Sports, Hindustan group attended the press meeting and briefed the press on the arrangements for the meet. Prof. C. Robin the district Governor of Y's Men International Madras district said that Y's Men International was happy to be associated with the event especially to support the under privileged children.